Just been too busy to post much but wanted to share this great trade made by another member of my family. Bought Las Vegas sands on 10/31 at $51.50. Nice trade as it is above $55. 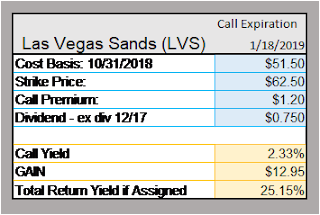 Sold this call today for a greater than 25% potential gain. Take a look.